A R4 discussion on 30.12.09 on this book, published in 1957, which I read in my first burst of reading about literacy, a time in which I read everything I could get hold of in order to try to find some keys to the problem. I was puzzled then, and am now. The book says a lot about British social class, but nothing I can find about literacy and its uses. Today again, the panel are talking about their place in the class system, council estates, hardship, but not about literacy. Why did he pick literacy for a title? Is it all some kind of hidden sub-text? And why has no-one questioned it? The Road to Nab End says more about literacy and education in this context, and I strongly recommend it. "These are working-class families. They don't go to the library much. Don't give them the (reading) list." This piece of crass ignorance from an English teacher in a comprehensive school is just a snippet from this article by Gabriella Gruder-Poni in Reader. Actively discouraged by an anonymous (unfortunately) tutor, Mr F. from developing her pupils' vocabulary and actually teaching them English, she is subjected to a combination of ignorance and power on a small scale that is totally anti-educational and amounts to student abuse. Not clear whether she passed or failed, but this must change. Peter is eleven and likes Horrid Henry. He comes across the word stomach, and can't work it out. He tries something like stome atche, which doesn't make sense. Stomach contains two irregularities, one very frequent, the other less so. apart, of course, from the last two. I explained stomach, went back to the beginning of the sentence, and Peter got it right three times in a row. I then used my normal grid system with the other words he got wrong, and gave it to him for practice. Will update on this next week to tell you how much Peter remembered. 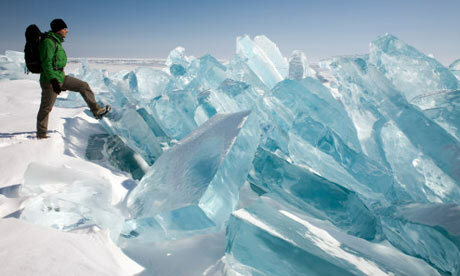 I'd never heard of Lake Baikal. This account, with a breathtaking photograph of the lake's frozen ice, is brilliant and worth reading if you haven't either. I managed to copy the pic. The House of Lords' debate on languages on 3d December 09, here, is yet another series of lamentations about the decline of languages which does not address the essential question of why so many children are failing in the state sector and succeeding in the private sector. Baronees Verna offered the statistic that candidates from the private sector were four times as likely to get a A* in German and five times as likely in French. Getting Maths right - squaring the circle? The first prerequisite (for multiplication and division) is that you know thoroughly and can recall instantly all the results in the multiplication tables up to 10x10. Make sure pupils are thoroughly conversant with their multiplication tables up to 10x10 before they embark on multiplying bigger numbers. Pupils should be taught to recall all addition and subtraction facts for eacu humber up to 20. Unfortunately, Derek Haylock does not say how either of these should be achieved, and this is a big problem. Some children I've taught don't know any number bonds beyond 2 +2, and an eleven year old I'm currently teaching could only subtract six from 10 by counting on from six. These facts are crucial, and so teaching them should be a major part of any book on primary mathematics. They need to be understood, not learned by rote, and the road to understanding them is Fernald. 2. HMI in their 2008 report on maths identified several problems, including weaknesses in teachers' understanding of maths, and an emphasis on applying formulae and algorithms that prevented children from developing their understanding of the underlying mathematical principles. They did not identify, address or even mention weaknesses in number bonds and tables as a factor in mathematical achievement. The report is here - and I'll correct this statement if it's wrong, but I've read the report carefully and searched it. 3. Summary and conclusion. The leading writer on mathematics in teachers' education and training pays lip service to number bonds and tables, but without any advice on how best to teach them. HMI ignore the issue completely in a report that is otherwise well argued. Teach number bonds, tables and calculation specifically and carefully, using the standard formats and not adhoc formats as recommended by Derek Haylock. Teach other aspects of mathematical thinking alongside these, encouraging children to look at other methods and consider them critically, but only once the normal ones are clear in their minds. Once again, any thoughts on this will be appreciated. One thing is clear - I should not be teaching clever 11 year olds their 2 times table, or how to subtract 6 from 10 without counting on. The present system is reducing children to using their fingers and thumbs, and that is no more a route to higher mathematics than chanting tables without understanding them. GCSE French from Scratch. Lesson 2. Practising Fragments and Networks. Introducing questions. Numbers to 12, then to 20 and 25. Il est deux heures, trois heures, etc.Note that we add s for more than one hour and, that hours are feminine. For minutes past, we say the hour and then the minutes. Il est onze heures vingt-cinq - It’s twenty-five past eleven. Il est neuf heures et demie – it’s half past nine. After half-past, we add moins. Il est onze heures moins dix - it’s ten to eleven. Instead of douze heures we would normally say midi for midday, and minuit for midnight. Recap the idea of verb and subject. Remember that not all verbs do things. Practice making at least one positive and one negative sentence with être – to be and avoir – to have. Explain that these are the names of these verbs and that we’ll come back to them later. Sample sentences are in lesson plans one and two. Have people work in pairs on their sentences and spend as long on this part as they need. French has three main ways of making questions. The first, which works in almost all European languages, is simply to raise the tone of your voice at the end of the sentence. Le train est parti? Has the train left? Tu aimes le foot ? Do you like football? Tu joues au tennis? Do you play tennis? Tu parles français?Do you speak French ? The second is to add a little formula at the start of a sentence we would make normally. The formula is Est-ce que…? - literally, Is it that..? Est-ce que le train est parti? Has the train left? Est-ce que tu aimes le foot? Do you like football? Est-ce que tu joues au tennis? Do you play tennis? Est-ce quetu parles français? Do you speak French ? The third way is to put the verb before the subject. This is sometimes quicker, but can sound a bit awkward with some constructions. Most often used with avoir. Tu as un frère. becomes As-tu un frère ? Vous parlez français. becomes Parlez-vous français ? Je vous écoute. I am listening to you. This is a joke based on the French examination system, which always involves an oral. Examiners always start the oral by saying this. (If time, more Zim Zam Zoum, but there probably won’t be). Note: I welcome corrspondence - if any teachers are interested in developing this further, please get in touch. GCSE French from Scratch. Lesson 2. Practising Chunks and Extending Networks. Intro: Practise chunks from last time – Bonjour introduce bonsoir, then bonne nuit, salut. Days. Numbers to 12. introduce vingt, vingt-cinq (and numbers 13-20 if people are happy with this). Discuss forms of words, looking at similarities with English, and pointing out the accents and their effects. Note the lack of capitals. Remember that for chunks, http://www.schoolslinks.co.uk/ has posters, http://www.education.vic.gov.au/languagesonline/ good practice materials. Teacher should allow as much practice as people wish, and make sure everything is fully understood. Look again at the sentences introduced in Lesson 1, and have class say them after you. Does everyone understand? Then have each person pick three or four sentences that apply to them, and say them to a partner. Partner reciprocates. If participants want to use other adjectives, teacher supplies them. Check that people can write their sentences accurately from memory without copying – have them check each other’s and encourage them to find a learning partner to practise with between lessons. 2. The French for I have is j’ai. The French use j’ai and je n’ai pas for a whole range of things, some of which they say differently from the English. When they say je n’ai pas, though, they make another change – they substitute de for un or une. J’ai un vélo (bike) Je n’ai pas de vélo. Have class make at least one sentence each with j’ai and je n’ai pas, giving any vocabulary they need. Conclusion Check that everyone understands, then play Zim Zam Zoum songs 1, 2 and any more there is time for. How to solve basic problems with maths. Numeracy Problems, their origins and solutions: Draft 2. My interest in numeracy stems from my work with people who had problems with literacy – they almost always had numeracy problems too and needed help. My first client was a young man who needed to pass the maths section of the police entrance exam in the eighties, for which he needed to understand decimals and percentages. I unpacked both for him, into very simple terms, and he passed. The late Dr Margaret Peters recommended to me Grace Fernald’s Remedial Techniques in Basic School Subjects (McGraw-Hill 1043). Dr Peters had been concerned only with Fernald’s literacy work. I took Fernald’s chapter on numeracy, and used its assessment and teaching systems as the basis of an experiment designed to improve knowledge of number bonds in the weakest 20 pupils in a large comprehensive school in south Essex. The approach addition, subtraction, multiplication and division, with Fernald’s teaching reinforced by computerised practice. The mean scores of the pupils in the project rose from 45 to over 95. Further to John Bald's very interesting article on slow early learners ("Recovery vehicle", Mathematics Extra, TES, October 7), I would like to point out that I have been carrying out research very much on some of the lines that he suggests, since March 1993. The study is funded by the Economic and Social Research Council, and I presented part of it at the British Psychological Society Development Section Conference last month. The study involves a detailed investigation of the arithmetical and other cognitive strengths and weaknesses of six to nine-year-old children, and also of adults. So far, nearly 100 children have been studied. It is clear that there are often discrepancies between different arithmetic-related abilities : notably, there are children (about a quarter of those in the present study) who are much better at arithmetical reasoning than at calculation. The results of this study so far show one highly significant difference between children with and without such a discrepancy between reasoning and calculation. This difference was that children with such a discrepancy appear significantly more likely also to show a marked unevenness in general cognitive abilities, as demonstrated by a wide scatter of scores between and within different standardised tests (for example, between verbal and performance IQ scores on the WISC). So far, there does not seem to be any single consistent pattern of unevenness. One likely hypothesis that might explain at least part of this phenomenon is that teaching in schools, especially in a highly structured subject such as arithmetic, is geared toward children who do have a relatively uniform pattern of abilities. Those who do not may fall behind and this is likely to affect calculation more than arithmetical reasoning, which may be less dependent on school instruction. One of the main conclusions stated in my conference paper was, indeed, as follows: "My findings of uneven patterns of arithmetical ability and of a relationship between these and generally uneven cognitive patterns may suggest that a Mathematics Recovery programme, similar in principle to Reading Recovery, might help to ameliorate numeracy problems. One might expect it to work best if introduced at the relatively early stages of arithmetical development." More recently, I have worked with six individual pupils, aged 10 to 12, who had numeracy as well as literacy problems. The approach is still based on that of Fernald, but is now also informed by findings of current research in the way that networks are formed and reinforced in the brain. There is a certain amount of common ground here between the development of fast, accurate word recognition in learning to read and learning languages, and the knowledge and understanding of number bonds that frees pupils from the need to tackle every issue by going back to the beginning and “counting on”. 1. Establish number bonds for all single digit numbers. This can be done systematically using Fernald’s assessment sheets photocopied and enlarged from her book, but I prefer to do it orally, beginning with the easiest combinations and concentrating on any the child gets wrong (usually those going over 10). Every pupil with a mathematical problem I’ve met has a weakness in this area that needs to be addressed, and I don’t do anything else until they are confident with these additions. Reinforcement techniques are well known – I use cards (throw 2 cards from a pack at a time for an instant response, having removed face cards, and usually 10s and aces). Children write down and practise any that cause problems. I often change the subject after a session, discussing anything of interest to the child, and then after a few minutes flash back to the point of difficulty. This improves fluency, and I don’t usually find that I need to reinforce this part with computers. If I do, I use Number shark. If they get stuck themselves when I’m not there, I suggest they “put the bigger number in their pocket” and count from there. They then write down the sum and try to remember it. This is reinforced by practice over succeeding weeks until the bonds become automatic. The same procedure is carried out with subtraction bonds. Counting on as a method of teaching subtraction, without continuing to learn the number bonds, seriously interferes with children’s later ability to tackle both subtraction and division. I’ve found that one or two lessons is usually enough to establish number bonds, but continue to practise them orally or using selected cards, until children get them right without hesitation. The approach, when stuck and on their own, of going back to something they are sure of, rebuilding from there, and then practising the point of difficulty until the right answer becomes automatic, is central to my approach and rooted in Fernald’s. It is different from drill and skill because it does not go through everything from scratch each time, but concentrates the pupil’s attention on the point of need. In this respect it is very similar to music practice. 2. Once addition bonds are established, I move to tables. I have found a pattern of error in tables in children slipping from one column to another – eg one two is two, three twos are – through counting on from whatever number they’ve just said. I correct this by explaining what the children are doing, and then carefully helping them to say 2s until they are accurate and fairly fluent. I then move to 3s, and do not move on until these are accurate, continuing to build fluency with 2s by practising and explaining. If a child makes a mistake, we go back to one they got right and proceed from there. The principle is explained as often as necessary. I use beats with each hand to explain it, and a colleague suggests a pendulum movement can also do the job. But I do not count in multiples, as this does not allow the child to locate a point in a table as and when it is needed. The point of tables is, of course, to allow the child to multiply and divide accurately, and not to chant tables. I do not use chanting in a group as this hides what individual children do and don’t understand. I continue with tables until we get to 12 and take them, as the Lottery says, in ascending numerical order. Once the principle is established, there is no need to take all of the easiest ones first. 3. Once addition bonds are established, I teach addition, first of single numbers, and then of larger numbers using the column method. We do not “carry” one, but write any number that is larger than 10 – it cannot be larger than 10 – diagonally, in a way that makes it as if the ten moves itself to the next column. Similarly, with subtraction. Subtraction bonds to 20 need to be practised as above. Then, if we can’t subtract a number, we do not “borrow and pay back” but move one of the tens across to the units to create working space. As we’ve moved it, it can’t be in the same place any more, and so the tens are reduced by 1. And so on with larger numbers. This approach avoids the potentially misleading terminology of carrying, borrowing, and paying back. 4. Addition and subtraction can be taught while tables are still being practised. Once some tables are fairly secure, they can be reinforced by beginning multiplication using the traditional algorithm, and continuing the idea of writing two-digit products on a slant to make it easy to add them to the next product. Multiplication is extended as fluency with tables is increased, and is extended to long multiplication as children become confident. 5. Division depends on accurate multiplication to see whether a number will or won’t go, and on the ability to subtract accurately so that the calculation can be continued if a number does not divide exactly. It is introduced once number bonds and tables are established, again using the vertical algorithm – though the explanation of dividing a large sum into several small ones is retained, so that the children know what they are doing and why at each stage. There is an effective demonstration of this approach in the CGP KS2 maths revision books. 6. This approach is clearly at odds with much national strategy guidance and with the work of influential writers such as Derek Haylock, who omits long division completely and advocates “adhocorhythms” for almost every calculation. It is based on the idea that number bonds can be clearly established, provided they are taught in a way that children understand, and are then practised. Ad hoc methods are not more effective than established column methods, and devising them almost always distracts children from the task of calculating accurately. One reason for their development, according to Haylock, is the errors children make with column methods, and children do make mistakes. It is, however, more constructive to analyse the errors they make and adjust teaching so that they make fewer errors, rather than to send them into a maze of possibilities that leaves the central weakness in number bonds untouched. 7. We know that, as we learn, the brain builds up intercommunicating networks that allow information and ideas to move around it at the speed of electricity. The establishment of these networks is the physical manifestation of understanding. If we don’t understand, the networks don’t connect properly and information won’t flow. If we understand a little, they work, but slowly and hesitantly. We don’t build networks by giving children too much at once – eg chanting all 12 tables without explanation, or going on to harder tables such as 7 and 8 when children don’t know 2 – or by bypassing understanding. We need to explain everything at each stage, so that children see the point of the work. 8. The final obstacle to understanding is language, which at times in mathematics is deliberately obscure, even when the words used are simple. Since the 1980s I’ve heard the argument that the problem is “not with doing the sum, but with finding the right sum to do”. The language of mathematics is a problem, and particularly so for children whose English is not fully secure. Once number skills are established, it becomes essential to explain the language of mathematics and of mathematics testing, so that children can see what they need to do and extract the right calculation from what often amounts to deliberate obscurity – in some respects we have advanced little from the days of “if a herring and a half cost three-ha’pence”… This requires very careful teaching of reading, so that the child pays close attention to what is on the line and to exactly what it means, a type of reading that should be included in the English national curriculum but is not. Similar reading is required for science. 9. Further calculations, including those involving shapes, decimals and fractions, can be taught straightforwardly once number bonds are established, and are virtually impossible to teach if all of a child’s attention is taken up with calculation. The same principles as above apply – we teach precise thinking, and achieve it through explanation, understanding and practice. Any comments on this paper gratefully received, and will be acknowledged in any redraft unless you ask me not to. GCSE French from Scratch. Lesson plan 1 Revised. 1. We will take small steps so that everyone understands, but we need to practise the content of each week’s lesson before the next. Try to go to France in your mind for at least 10 minutes a day. 2. This section is under revision. The idea of "chunks" here means little fragments of language, such as greetings and numbers that are useful on their own, but do not lead to the formation of sentences, which is the key to communication. "Chunking" is used by some teachers to mean presenting little units of language that are in fact grammatical constructions ( eg J'ai, I have), but which are not unpacked so that the learner fully understands them. I see this as a major error in teaching, and am considering revising my use of "chunks to avoid misunderstanding. Fragments and Networks. This idea seems to have begun with analysis of artificial languages, but it fits natural ones and helps learning. A fragment is an isolated item of language, such as a greeting, a number, a day of the week. They are very frequent and useful, but do not let us communicate most of what we need to say – fragments may be combined to tell the time or give a date, but that is about it. Networks are the basis of sentences, which are the basis of human communication even when we take shortcuts with them. This lesson will introduce key chunks and simple networks in French. The chunks will help us practise pronunciation and French spelling. The networks will enable us to build the skills we need to communicate with French people, teach our classes, and, if we wish, pass GCSE. 1. Spoken French runs words together to create flow. It pronounces words more evenly than we do in English. For example, domino is pronounced in English with stress on the first vowel, and in French with a very even pattern across all three (example first seen in Petit Pont). 2.Written French ties words together by means of letters, at the ends of words, that are usually not pronounced. As a result, there are roughly four times as many silent letters in French as in English. The good news is that very nearly all silent letters in French are at the ends of words, and that they follow regular patterns. Children can learn these with explanation and practice. 3.French relies heavily on vowels. A vowel is a sound made by the voice – vowel letters represent voice sounds. We normally take a shortcut by referring to vowel letters just as vowels; as a result, we often lose sight of the connection between vowel and voice; this is essential for language teaching, as there are more changes to voice sounds than to consonants. 4.Pronouncing two vowels one after the other usually produces the glottal stop, which interrupts flow. To avoid this, the French alter their normal practice of omitting letters at the ends of words, and pronounce them when they are followed by a vowel (in Vous avez – you have – the s is pronounced. In vous donnez – you give – it isn’t.). They will even insert a letter, usually t, to produce the same effect. (Va-t-en - go away), or sometimes drop the first vowel completely T’aimes ça ? – Do you like that? These features take practice, but are easier to learn once you grasp the underlying principles. 5.French categorises all nouns as masculine and feminine, whether or not they have any connection with masculinity or femininity. Bringing children to understand the idea of gender, and its effects, is important to long-term success. The idea that gender applies to things rather than people is a big step for an English speaker, and requires careful presentation. An initial approach of “boys’ words” and “girls’ words” has proved helpful, and children understand the idea that gender in language reflects the roles assigned to males and females in ancient history and myth, and that this has been retained in some modern languages. We’ll start with some fragments. The French don’t have a direct equivalent of hello. Like some Australians, they wish each other good day instead. So we now know three words – bon, jour and bonjour. Jour is masculine. The n in bon is softened a little compared with English pronunciation, and the whole word is pronounced evenly, like Petit Pont’s domino example. Petit Pont means little bridge. We don’t pronounce a t at the end of a French word unless we’ve learned we need to. Bonjour is run together as one word, but Bonne nuit isn’t. Lo nuit is feminine, and any adjectives attached to it have to be feminine too. The feminine is usually stressed a little more than the masculine, and so the harder pronunciation keeps the words separately. Wish a partner first, bonjour, and then, Bonne nuit. Count up and back, and explain the pronunciation. Pick out the English word that is the same. What French word has the same spelling.? Note that we pronounce the t at the end of sept and huit – hence the careful phrasing of the guidance on pronunciation above. 3. Easy interval. Put up displays of days of the week and sing to Frère Jaques. Draw attention to di as a recurring feature, and as the French pronunciation of i. 4. Freebie No. 1, courtesy of William the Conqueror. Between 1066 and 1300, English became flooded with French. This led Jules Verne to remark that a lot of English was just badly pronounced French. The good thing here is that these words tend to be grown-up words, and allow us to communicate in an adult way. Look at the list from the Notes, and explain as much as people seem interested in. We will return to this. 5. SongZ im Zam Zoum song 3, Les Bonbons. Stop the counting at 12 unless people want to go on. Explain toi and moi. Go back to bonjour – bonbon – masc/fem? The key components of a sentence are verb, and subject. The subject is not what the sentence is about, but whoever or whatever is doing what the verb does. This is the same in English and French. Not all verbs do things. Some just think, feel or are. Michel Thomas said that one way to indentify a verb in English was to see if you could put to in front of it and still make sense. The most common verb in European languages is the verb to be. To make any French sentence negative, you find the verb and put ne and pas around it – a bit more complicated than adding don’t. Have people write as well as say whatever applies to them, and look over for next week. They do not copy – they hold sentence in head and write it. If they get it wrong, they write sentence again. They only write the sentences that apply to them. If they want to write any others, teacher should provide the necessary vocabulary. If there is time, go onto avoir. If not, play out with les bonbons again.